Code for America is honored to announce a partnership with the State of California to make GetCalFresh.org available to residents across the state. Together, we are continuing our mission to deliver a truly accessible, dignified, and effective way for people to get help in times of need. By Alan Williams, Senior Product Manager at Code for America, and Dave Guarino, Senior Software Engineer at Code for America. Over two years ago, our small team at Code for America built the initial version of GetCalFresh.org. It was the first time an American applied for Supplemental Nutrition Assistance Program (SNAP), our national food assistance program, from a mobile phone. 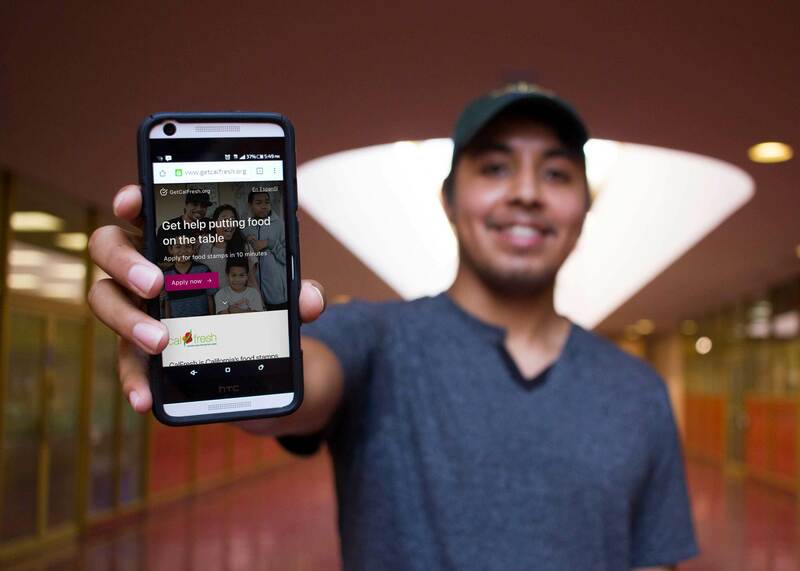 “This is the first site that lets you apply for CalFresh [SNAP is known as CalFresh in California], on your phone. You are not tethered to a computer...you don't have to visit an office. You can do it wherever you are,” said Leo O’Farrell, the CalFresh Program Director at the San Francisco Human Services Agency. What began as a simpler way to apply online soon became something much more. As people used GetCalFresh, we learned about the very human experiences, challenges, and outcomes that followed. The website was the seed of new digital service. Every day since, we continue learning more about the needs of the people we serve. Today, we are honored to announce a partnership with the State of California to make GetCalFresh available to residents across the state. Together, we are continuing our mission to deliver a truly accessible, dignified, and effective way for people to get help in times of need. It’s an urgent mission. We know that when people get it, SNAP works. Its use is highly correlated with better health and education outcomes for kids and with resilience and self-sufficiency for adults. In California, two million residents who are eligible for CalFresh aren’t participating. Instead, families struggle to provide for their loved ones, kids go to school hungry, and taxpayers pick up the bill in the form of more expensive public health interventions and care. This “participation gap” is first and foremost a delivery challenge. For residents, GetCalFresh is a faster, more accessible, more private, and more respectful way to get help. For public servants and social workers in counties across the state, GetCalFresh is an entirely new window into the barriers people face while navigating the system. Working to remove barriers with our digital tools, we are ensuring our partners have timely, relevant data to help them drive continuous improvement in government operations and policy. To close the participation gap, it's imperative to align our interests with those of the residents we serve. To that end, in our contract with the California Department of Social Services, we are serving as the nation’s first software-driven SNAP Outreach partner. This contract makes us accountable to our mission of reaching hundreds of thousands of families who are eligible for benefits in a way that works for them. And we’re in good company— joining food banks and other community-based organizations that have been awarded similar SNAP Outreach contracts. Already, we've made applying for food benefits easier, more dignified, and less burdensome for more than 30,000 people. On average, it takes people eight minutes to submit an application, compared to 45 minutes through the alternative. People can now submit key documents using the mobile phone camera they carry in their pocket, rather than hunting down a scanner or fax machine. As a result, more people who are eligible are getting food assistance when they need it most. “We know that more clients today are applying online and maintaining their eligibility through an online account or telephone support… We want to create more and more doors and on-ramps. And one of the ones we are very excited about is one that Code for America partnered with us on: GetCalFresh,” said Kim McCoy Wade, Chief, CalFresh Branch at California Department of Social Services, at the 2016 Code for America Summit. Help us build a world-class team. We need you to share this opportunity with the talented, driven people in your life who are looking for an opportunity to deliver meaningful, measurable impact at scale. We’re hiring engineers, designers, growth marketers, and policy wonks. Help us build an advisory community of leaders around the country. We’re looking for leaders in government, community based organizations, technology and product development to help us overcome the many challenges ahead. Help us find partners who can expand our reach. We need to reach people from all walks of life, from all over the state. Let us know if an organization you support serves seniors, students, and low-income working families. Email us.